More than twenty-five years after the groundbreaking movie "Star Wars: A New Hope" first hit the silver screen, "Star Wars" remains one of the most beloved sagas ever told. Together, the three original "Star Wars" movies-"A New Hope," "The Empire Strikes Back," and "Return of the Jedi"-told one epic: a heroic tale of innocence lost and wisdom gained, of downfall and redemption, of the never-ending fight between the forces of good and evil. Read the story of the movies-all three in one trade paperback volume-and rediscover the wonder of the legend that begins: "A long time ago, in a galaxy far, far away . . ."Luke Skywalker lived and worked on his uncle's farm on the remote planet of Tatooine, but he yearned to travel beyond the farthest reaches of the universe to distant, alien worlds. Then Luke intercepted a cryptic message from a beautiful, captive princess . . . and found himself catapulted into the adventure of a lifetime. Luke Skywalker, proud Princess Leia, and headstrong Han Solo . . . merciless Darth Vader, wise Obi-Wan Kenobi, loyal droids R2-D2 and C-3PO, and the inscrutable Yoda . . . Chewbacca the Wookiee, shifty Lando Calrissian, and the vile Jabba the Hutt . . . all the vivid characters from the "Star Wars" universe spring to life in these thrilling pages. 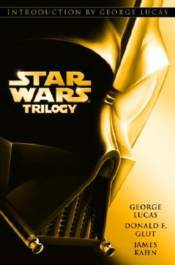 The" Star Wars Trilogy" is a must-read for anyone who wants to relive the excitement, the magic, and the sheer entertainment of this legendary saga-now and forever.